Synology launches the latest series of products in India; adding to its existing 18-series. The series includes DS118, DS218, DS218play, DS1618+, RS818(RP)+, RS2418(RP)+, RS2818RP+, RS3618xs and RX418. “Following on from the success of the first batch of 18-series release in April, we are elated to announce the launch of latest 18-series products in India. This launch will diversify our product range of 18-series in the market, especially for enterprise models, therefore can provide customers with more choices for suitable storage solution”, said Mike Shay, Sales Manager of Synology Inc.
DS118, DS218: These 1 and 2 bay 18-series entry-level NAS servers are ideal for small offices and home users. Equipped with Intel quad-core 1.4 GHz processor, these versatile yet budget-friendly NAS servers can provide good performance for not only personal cloud storage but also data backup and synchronization, media streaming, photo management, file sharing, and other tasks. The intuitive interface of DSM allows you to manage, protect and share all your digital assets easily and efficiently. DS218play: Designed for multimedia enthusiasts and home users who need a large personal multimedia library and also a reliable backup solution. DS218play supports real-time transcoding of 4K Ultra HD source content, which made it ideal for serving as the home multimedia centre. With the availability of centralized management, DS218play is ideal for fast file sharing and reliable backup for all types of devices. Besides, DS218play is an eco-friendly solution with the consumption of only 16.79 W in regular operation. RS818(RP)+, RX418, RS2418(RP)+, RS2818RP+: Three high-performance and scalable Plus Series RackStation are specifically engineered for growing small- and medium-sized businesses. RS818+/RS818RP+ comes with a quad-core processor with the AES-NI hardware encryption engine, quad 1GbE LAN ports, and optional 10GbE NIC support. The storage capacity of RS818+/RS818RP+ can be further expanded with Synology expansion unit RX418, providing up to 8 drives for flexible data management and backup. Powered by Intel Atom C3538 CPU, RS2418+/RS2418RP+ offers great flexibility in terms of expandable storage capacity (up to 24 drives with one RX1217/RX1217RP) and upgradable memory (built-in 4GB DDR4 UDIMM, up to 64GB). Equipped with a PCIe 3.0 slot, RS2418+ supports installing an M.2 SSD adapter card or 10GbE NIC for a high-IOPS system cache and ultra-fast data transmission. RS2818RP+ is Synology’s first 3U RackStation NAS in the Plus Series product line. RS2818RP+ is powered by an Intel Xeon D-1521 quad-core CPU and 4GB DDR4 non-ECC UDIMM RAM (expandable up to 64GB). The four plug-and-play Gigabit Ethernet LAN ports can be expanded with higher performance 10GbE NICs. The 3U chassis design accommodates up to 16 drives and the storage capacity can be further scaled up to 28 drives when connected to one expansion unit RX1217(RP). 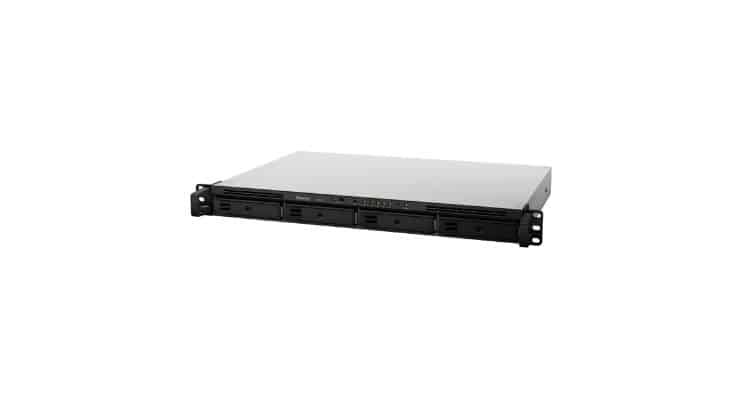 RS3618xs: Synology RS3618xs is a 12-bay rackmount NAS providing excellent performance, effortless capacity scaling and optimized virtualization solutions for expanding businesses with demanding business applications. Features an Intel® Xeon® D-1521 quad-core CPU and 8GB DDR4 ECC UDIMM RAM (expandable up to 64GB), RS3618xs has high scalability with up to 36 drives. Complete virtualization solution with Synology Virtual Machine Manager is supported in this model too. The latest 18-series models are now available in India through multiple channels.